The following newspaper article appeared in the February 6, 2017 edition of the Cumberland Times-News. Darlene Shelton also appears in other articles on this African-American history website. 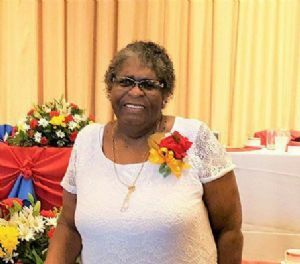 FROSTBURG — Darlene Shelton was one of 12 distinguished individuals honored recently at the Washington Conference Branch Women’s Missionary Society African Methodist Episcopal Church’s 17th annual recognition luncheon held at Martin’s Camelot, Upper Marlboro. Shelton is a member of Dickerson African Methodist Episcopal Church and the Fannie Daugherty Missionary Society, where she serves as a pro tem member on the board of stewards and stewardesses. She has also served as a pro tem member on the board of trustees. Shelton is a board member of the Frostburg Food Pantry and each summer she volunteers to help prepare lunches for the Frostburg Area Summer Lunch Box Program, a six-week program providing lunches to area school children while school is out. Shelton visits the local nursing homes and accompanies the Rev. Meredith C. Hudson, pastor at Dickerson, for worship service at the Western Maryland Health System Nursing and Rehabilitation Center. Shelton is the mother of two adult children, Timothy and Leticia Shelton, and grandmother of Brandi and Skai Shelton.